Irregularities in Earth's upper atmosphere can distort GPS signals and NASA has teamed up with University of New Brunswick geodesy and geomatics engineering researcher, Richard Langley, to study these irregularities in hopes of diminishing their effects on communications. When you don't know how to get to an unfamiliar place, you probably rely on a smart phone or other device with a Global Positioning System (GPS) module for guidance. You may not realize that, especially at high latitudes on our planet, signals traveling between GPS satellites and your device can get distorted in Earth's upper atmosphere. 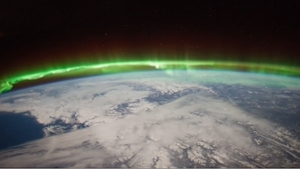 Researchers at NASA's Jet Propulsion Laboratory in Pasadena, California, in collaboration with Dr. Langley, are studying irregularities in the ionosphere, a part of the atmosphere centered about 350 kilometres above the ground that defines the boundary between Earth and space. The ionosphere is a shell of charged particles (electrons and ions), called plasma, that is produced by solar radiation and energetic particle impact. The researchers are using data from an instrument on the Canadian CASSIOPE satellite, which was launched in September 2013. Called GAP, short for GPS Attitude, Positioning, and Profiling, the instrument (designed at UNB) uses GPS signals to help reveal the nature of the plasma irregularities. The research has numerous applications. For instance, aircraft flying over the North Pole rely on solid communications with the ground; if they lose these signals, they may be required to change their flight paths. Radio telescopes may also experience distortion from the ionosphere. Understanding the effects could lead to more accurate measurements for astronomy. The study was recently published in the journal Geophysical Research Letters.